August may be coming to an end, but it’s still super hot out! With Labor Day weekend right around the corner, I thought It would be appropriate to share one of my favorite indulgent-decadent-not-for-anyone-on-a-diet vegan treats—the Oreo Frappuccino. The Oreo Frapp has been on the Starbucks Secret Frappuccino Menu for as long as I can remember. I first saw a girlfriend buy one of these bad boys after a long night of partying. I was not vegan at this point, but was never a huge fan of the sugary coffee drinks, and hated the coffee at Starbucks. But this, this I could not, not try. One sip and I was both horrified and impressed. I started to make these on hot summer days instead of milkshakes when I was feeling PMS-y or just really wanted a sugar rush. I feel less guilty about this when I make it at home, because I use real, healthy (aside from cookies LOL) ingredients and coffee that actually tastes good. 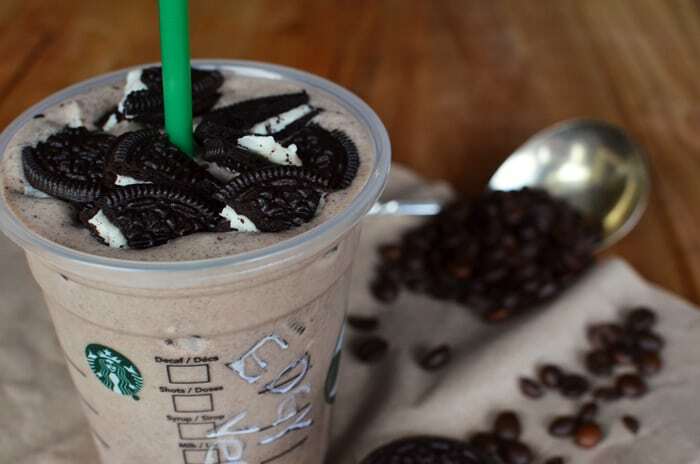 The Oreo Frappuccino also known as a Cookies and Cream Frappuccino, is a well loved item on the Starbucks secret Frappuccino menu. Learn how to turn your favourite Starbucks drink vegan by following this delicious dairy-free recipe! It's like a vegan cookies and cream milkshake. Add more coconut milk or sugar to taste and more ice if you like your frapp extra thick!